It pitched for laughs. A lot. But on a day when the biggest breaking news in football was Tayla Harris, the issue only registered a few minutes discussion on Nine’s new-look AFL Footy Show. If it wanted to demonstrate it means business, the show really should have had Harris on set (radio managed it yesterday morning). It would have drawn a line in the sand between two eras. Instead this was more Before the Game than the traditional AFL Footy Show with Anthony ‘Lehmo’ Lehmann, Neroli Meadows, Brendan Fevola and Dylan “I’m a tennis player on a footy show” Alcott (his words). 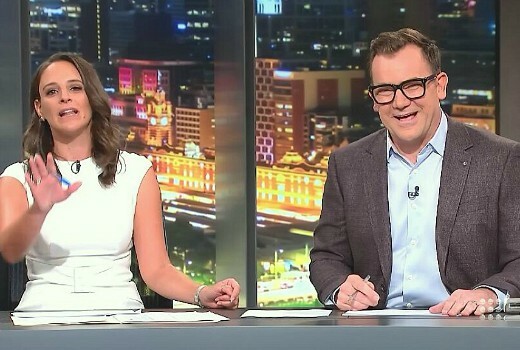 While Lehmo kept things moving, and the studio audience was on side, team sheets had been discarded for gags and comedy. There were AFL coaches talking Married at First Sight, Shane Crawford in pre-recorded segments with players, plus guests Mason Cox, Shaun Burgoyne, Matthew Lloyd, Nathan Brown and Billy Slater. ‘Supergroup’ Arc closed the show, running 10 minutes overtime despite being pre-recorded. Ironically Sam Newman had caused offence on Twitter on the very same day, taking aim not at the show, but at the accent of NZ Prime Minister Jacinda Ardern. I guess we were lucky he wasn’t around to discuss Tayla Harris after all…. On social media the weight of the comments was far more negative than positive, targeting everything from casting to expertise to Neroli Meadows’ laugh. But it will be OzTAM ratings where it counts most. Haven’t watched @AFLFootyShow in years because it got so awful. Tonight is the first time I’ve sat down and genuinely enjoyed it thanks to great presenters like @DylanAlcott. Wasn't going to watch the #aflfootyshow. So glad I did, @DylanAlcott Is hilarious. #9aflfootyshow has been turned into an FM radio morning program. This isn’t the footy show I’m watching the project afl version. If People don’t like The Footy Show.Change stations. I Hope they show the teams when we get back to Thursday nights. The worst part was Neroli laughing at everything, was the main complaint on social media. I gave it five minutes and went back to The Front Bar! Oh my god thank god Sam was not on. Could only imagine what he said about the photo. Look it was there first show together. When the show gets back to Thursdays they will be able to talk about the teams and games a bit more. I saw bits of it flicking over the front bar. I chose to watch the front bar just because it flows and is funny. Sadly before the footy show went to air I knew when I checked social media that Nez would be the one copping it. Yes people had opinions on the others but she was the one that was getting the negative comments. Anyway you can’t judge it after a week. Really? She was arguably the best. Bring back Sam, Garry and James! I’m going to it’s recording next Wednesday… but after watching the show last night I’m not as enthused as I was when I scored the audience tix. I thought it ran smoothly, but that’s the problem in a sense… it ran so smoothly that there was no standout moments or any memorable points to it. It was just a one note show. No highs or any particular lows. I thought it needed a few segments to break things up. And I’m not liking the guests coming in and sitting on couches whilst the panel remain behind the desk, it looked awkward. I don’t know… bottom line is I think it’s well and truly lost its identity. They still need to include some variety on the show imo… like having the guests compete in a challenge of some sort against a panel member… stuff like that.